Mahatma Gandhi Quotes Top 10 List. Famous & Inspirational Gandhi Quotes! Here is a wonderful collection of Mahatma Gandhi Quotes for you. Enjoy these famous Gandhi quotes! Weeding is as necessary to agriculture as sowing. 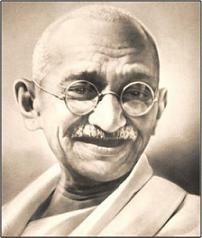 I hope you've enjoyed this Top 10 List of Quotes By Mahatma Gandhi.